As we mentioned on Friday, work began yesterday at Disney California Adventure park to transform the current Golden Gate Bridge at the park’s entrance into a re-creation of the historic Glendale-Hyperion Bridge. 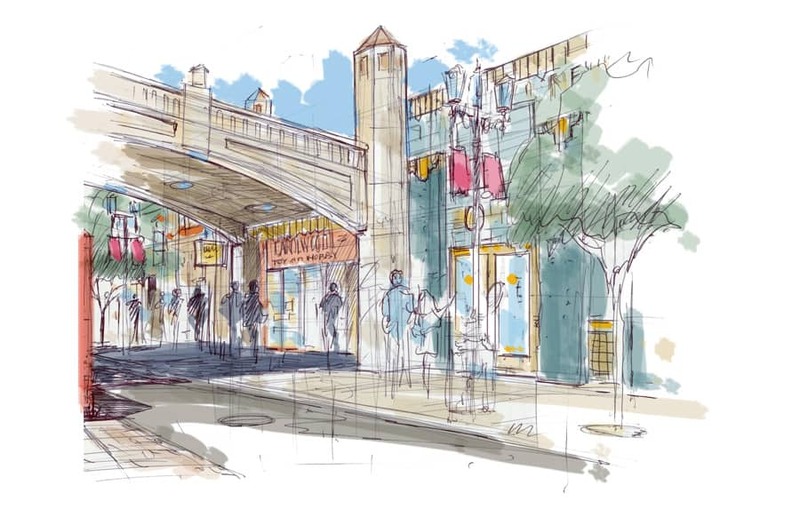 The rendering above shows what the new bridge will look like when it is completed as part of the new Buena Vista Street area. This new area will bring guests back in time to a classic era in the history of Los Angeles – when Walt Disney first arrived in California. You will practically walk in his footsteps through an environment inspired by iconic Los Angeles buildings and structures of the 1920s and ‘30s, like the Pan Pacific Auditorium (which served as the inspiration for the new park turnstiles that opened on Friday) and the Glendale-Hyperion Bridge. In January 1926, Walt and Roy Disney moved the newly renamed Walt Disney Studios into its new facility – a one-story, white stucco building at 2719 Hyperion Ave. During the next few years, another Los Angeles landmark was taking shape just a few blocks down Hyperion Ave. – the Glendale-Hyperion Bridge. The bridge is a large, complex structure – still standing today and spanning Interstate 5 from Glendale, Calif., to the Silver Lake area of Los Angeles. 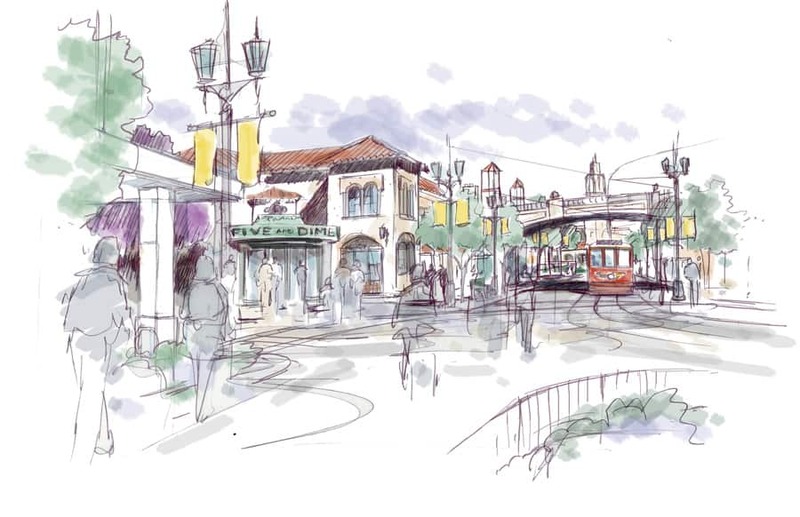 The artist’s rendering above shows the bridge as it will look next year when it is part of Buena Vista Street at Disney California Adventure park, with the Southern California Red Car Trolleys passing underneath and the Carthay Circle Theatre in the distance. I like the use of the design of the entrance of the old Pan-Pacific Auditorium on the entrance of DHS. This was the PPA that was featured in the film Xanadu. Horrible movie, but great soundtrack. ELO, one of my favorite bands was on half of it. Speaking of ELO, the “band” known as “The Orchestra” will be back at Epcot for the food and wine festival, Oct. 20-21. They will be performing all of ELO’s greatest hits. The band has two members from the classic line-up of the 1970’s. …I meant to say, Buena Vista Street is completely new in its design. I don’t think that there is any need for people to worry. California Adventure is definitely not turning into Hollywood Studios. Buena Vista Street is completely in its design. I have to say I’m a little disappointed that DCA is turning into Hollywood Studios. It’s already got the front entrance, and minus the bridge, the street view looks like Sunset Blvd in Hollywood studios. The big CALIFORNIA letters out front were uniquely west coast. Don’t get me wrong, I’m all for most of the changes, cars land,updated wharf, world of color, new rides. I’m just sad they copied Florida on the outside and when you first walk in. What will happen to the monorail track during renovation? By the way, there is just no comparison between California Adventure’s old Sunshine Plaza and Epcot’s World Showcase, the World Showcase is clearly better, with more details and better themeing. And that is ultimately my point, Buena Vista Street will be much more detailed and better themed than the previous Sunshine Plaza. That will be cool. I will definitely miss the Golden Gate Bridge though. No bigger California icon than the Golden Gate Brige. I would like to see it stay. Thanks for the update, Erin. Do you have any information on if the music soundtrack will be changing to match the time period? Again, I always enjoyed DCA. I always try to remain cautiously optimistic. I am excited for the changes. Ultimately, we need to keep in mind that changes are bound to happen. The park still has a California theme, and will continue to. I won’t lie, yes I did like the golden gate bridge and mosaic, but again, change is not necessarily a bad thing. So far, all of the changes have really improved the park. I mean, a lot of casual tourists don’t even know what Main Street is supposed to represent. Most casual tourists just know it as the opening of the park, nothing more. Disney parks are known for great themeing and details; locations that transport you to a different time and place. (Like the World Showcase at Epcot) and Buena Vista Street will do that. The new entrance will definitely be better. Believe me, I understand how everyone feels about losing the golden gate bridge and such, but look on the bright side, thanks photos and video sites like Youtube, nothing is really gone forever or forgotten. I agree with Elizabeth about the letters in front of DCA. I thought it was a very cool and distinct addition to separate the two parks. Honestly, DCA is looking more like Hollywood Studios. I wish they had a more original one of a kind concept of their turnstiles and the idea of Buena Vista Street. Regardless, I love DCA and I can’t wait to see the new changes. I know they’ll always be good with the creative imagineers we have. The changes being made to Disney California Adventure are tying in the whole Disney story for me: Main Street was where Walt Disney grew up at the turn-of-the-century and DCA is just like LA (Hollywood) when he arrived in the ’20s. It’s true we experience our parks differently than WDW. With so many locals who grew up coming to Disneyland and feel emotionally connected to the parks, we like to keep the Disney roots and storytelling in our experiences there. The new DCA will bring in all of that rich Disney history. I’m so looking forward to it! As for the letters themselves, they were originally supposed to produce a “postcard” when you took a picture of the whole entrance vista, with the Golden Gate Bridge and the back scenery. I had heard through the “mouseline” that actor John Stamos bought the Golden Gate bridge. The story goes that he wanted to purchase the large “CALIFORNIA” letters that stood outside the entrance, but they weren’t for sale, but the bridge was. Question is … where will he put it? Hi Erin! Do you know if they will be bringing The Walt Disney Story here to DCA? The one that is located at Hollywood Studios in WDW? Just curious, it’s such a great retrospective of the ‘beginnings’! From the first moment I saw the Golden Gate Bridge at Disney California Adventure, I thought that it was a great idea, but the proportions were very different from the original, and that has bothered me every time I see it. I realize that the bridge was a key piece of the entire ‘postcard entrance’ concept, but having the span so very short eliminated the majestic scale that makes the original bridge such an impressive landmark. So, for me, it never felt right. From the concept drawings, it looks like the new Glendale-Hyperion Bridge fits the new Buena Vista Street theme very well, and it also looks like the sort of bridge you would actually build over a span that wide. All of that will help support the feeling of walking into a particular era and place, rather than draw attention to itself. I’m looking forward to the change, and think it’s for the better, but I can absolutely understand the feelings of those who will miss the old bridge when its gone. I am sad to see all the changes. It’s been done before in FL. To me DCA was CA as Californians know it. The problem was that it wasn’t CA as in the movies. I found the mural more a rift on the American Craftsman movement than modern. I’ll miss it…though I am looking forward to Cars land. And if you remember, the park was left intentionally open/lean so as to give room for expansion and growth. I am both sad and happy about the changes. As a life time resident of California, I loved that there was a theme park with Disney quality that showed all the wonderful aspects of our great state. It was definitely undervalued by the masses. At first when I heard that they were going to change the park, I was upset. But I do understand why and I like the changes that are being made. They are still taking care with the park. I do like that there is more disney in the park overall. I LOVE the changes they made to the Paradise Pier area….and anyone who has seen World of Color will admit that it is a spectacular addition to the park. There have been many changes in 10 years it had been open already, and I am sure many more to come. I absolutely do not feel that California Adventure was too contemporary. I think it grasped the feel of California and not just LA. It’s sad that now instead of seeing a great landmark of the state, the Golden Gate Bridge, which is recognizable around the world, it will be replaced by something only recognized by locals. I think it’s sad that it’s changing and I’m extrememly disappointed. I will miss the Golden Gate Bridge and beautiful fountain. It was part of our family’s first trip to DLR with my son (when he was 15 months old) and my grandmother (when she was 89). I still remember rolling granma in her wheelchair and my son in his stroller through these areas. I will remember years later the California Santa and sand sculpture dolphins. All felt very California to me — and that is the point of this park. The only real complaint that sticks for me is not having enough to do in there. The addition of new rides over the last 10 years has really started to address that. I’ve noticed this is the way Disney creates their parks — they open with as little as they need to in order to justify a ticket price and then they keep adding. @Erin: are they going to rename it to Disney’s LA Adventure now that they are taking the rest of california out? I saw the new entrance at my last visit an frankly, it is hideous! Why spend all of that money taking out the letters, (which were always full of people posing for pictures so you can’t claim no one liked them) just to put in that ugly new entrance? Of course, I also never understood why they took out Maliboomer and replaced it with a bunch of nothing so what do I know? Truth be told, I was not a fan of Calif. Adventure as a whole from day 1. I did love, however. Soarin’, Screaming and Grizzly rides and Aladdin show. Other than that, I agree with Eric that there “wasn’t much in it to…do.” Of course, when it opened, I had 3 kids in tow, so the long distances really took their toll and made me cranky. I wish they had some sort of transportation from the main entrance to the Boardwalk area (remember when that was the parking lot, and we had trams to take us to our cars?) I am so very excited about the changes. I am not excited about the increased prices though. I want to have my cake and eat it too!!! I hope to be back with the family summer 2012. I noticed the new bridge design in the Blue Sky Cellar last weekend. The plans look fantastic. Personally, I like that DCA is now focused more on Disney’s history in Southern California and not trying to represent the entire state from Crescent City to San Diego. While the original tile entrance was beautiful (I still miss the Mary Blair mural in Tomorrowland), the plans for the new entrance plaza look to be far more inviting, similar to the flag pole area in Disneyland where people can rest and wait for friends or family when entering or exiting the park. I’m also glad the entrance gates have their own look and aren’t an exact replica of the Hollywood Studios entry. I am really bummed that they are taking down the GG Bridge. I live in the bay area and see all the time but there are a lot of people who can’t and that was the closest they would ever get. Is there a chance they will put it up somewhere else? Well Disney knows best and I am excited to see the renovations. Having said that… I love the new ideas. Walt Disney himself always looked to improve. 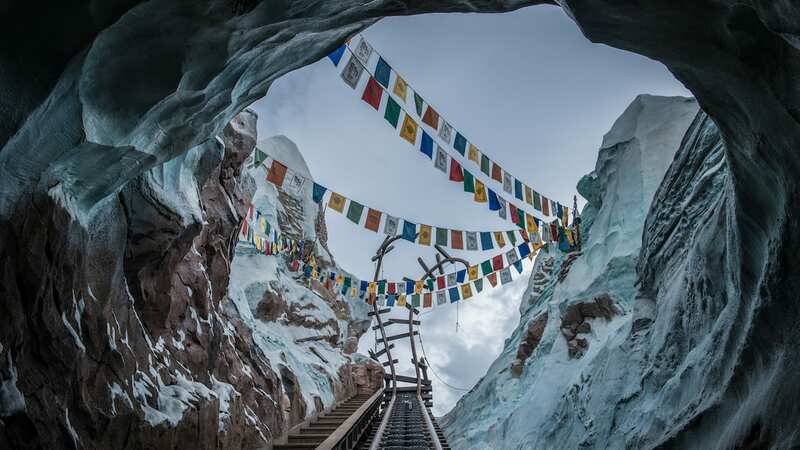 And if tweaking, and revamping the theme brings new life to the park – I’m all for it! As an avid park attendee-my husband & I are there every 60 to 90 days and have 3 trips planned before year end-I liked DCA when it opened. The spell out of California was cute and a great photo op locale. The G. Gate bridge? Loved it!! But as has been mentioned not every area of the park was as lovingly minded and also for us CA locals it wasn’t getting away from our backyards so to speak. Mulholland Madness- loved the coaster but unlike DLR I didn’t feel taken away from my day to day. Epcot has many different worldwide places to visit. That is exciting. That takes you away from the day to day. I had a feeling from day one that sooner or later DCA would become more Disney-fied. If they had made DCA with mini-lands to visit-mini China, mini Russia, etc-maybe that would have resulted in a different reaction from the guests. At the end of the day- we are excited to see DCA turn into retro LA. Love the red trolley cars!! My wish? More Stitch!!! and include classic characters like Clarabelle Cow and more contemporaries like Pocahontas or Mulan. Not just in the resturants but at select areas for meet & greets. 🙂 Walt would be proud I think. Too bad many of today’s younger guests don’t realize that there was in fact a man named Walt Disney that created/started all of this. Disney is Walt Disney, not just a brand. I’m excited about the new changes at California Adventure I loved the concept of what Disney did with the original park and yes I was really sad to see the Golden Gate Bridge go I loved seeing the monorail glide over it. The new cocept is very much like Hollywood studios in Florida but I rather see change then to see the park close. I’ve been visiting Disneyland since I was a kid and over the years it’s kinda give and take you get some things you like with the things you don’t I feel it’s a trade off for me Disneyland is always going to change and expand and for the most part they always seem to get it right I look forward to visiting the new california adventue and I’ll always have fond memories of the original. yeah it was tough. We got the epcot idea in california however like another post said you have a park about california in california for californians. thats the weird part. Im reserving my thoughts on the redesin until i visit… I am skeptical but love disney and will still go. Iam worried that i am visiting a new redesign and a bridge that i could just drive to in 30 minutes to see the real thing too and that seems a bit weird. We shall see if we really are transported in time it may work. Beautiful artist renderings. Looks like the work of the great Ray Spencer. As an Easterner and WDW regular I thought California Adventure was brilliant the first time I saw it. I thought Massachusetts needed such a celebration. But I can imagine for Californians who can visit all those landmarks in person, CA didn”t make much sense. I’m looking forward to seeing the new vision of how LA looked back in the day. Please don’t lose the winery, that is evocative of some of what Epcot offers. But the problem was also that DLR tends to attract a bigger percentage of loyal locals, and while it was beautiful to look at, the original idea of “When in California, visit California” just seemed to be too muddled a concept to attract both halves of the audience on its own. The problem with the “short-sighted” guests was that there was plenty of scenery that WAS up to Disney standards, just that there wasn’t much in it to….do. As long as they keep the idea vision to the Walt Disney-IN-California “biography”, it won’t lose its compass, and stay as a distinct complement to the old-school Disneyland half. Don’t get me wrong, I understand your passion. When I first visited California Adventure in 2001, I really enjoyed it. For the record, I was certainly NOT one of the many people complaining about it online, I enjoyed the park for what it was. I realize that they were trying something different. Some areas were well done. For example, the Golden State District is beautiful, and so was he title mural, and of course, Soarin’ Over California is phenomenal. but some areas of the park needed some work. I understand; the entrance mural and Golden Gate bridge were very nice, but again, a little too contemporary. Pretty much every other Disney park to date has a entrance that transports its guests to a different time and place. It was time for a change. And I wouldn’t worry, California Adventure will still have a different feel from Disneyland. For example, guests are able to order alcohol at DCA. The park still has an “adult” feel in places. In fact, a new drink location, “Bayside Brews” just opened in Paradise Pier. Disneyland itself went through a whole lot of changes in the years right after it opened. Change is not necessarily a bad thing. @ Fred, The tiled mosaic was not up to Disney standards? You’re kidding me right? You’re saying the rendition of the Golden Gate Bridge was not up to Disney Standards? Please, the people of California have no idea of the multiple theme park concept. It’s was suppose to be different; hence no Disney characters in the park when it opened. They were introduced to California Adventure shortly after it opened due to people wanting another Disneyland. We all know money talks so with dwindling attendance that’s what we’re getting, a rebirth of Disney Studios in Florida themed more closely to Walt’s experience upon arriving to California. Do I like the New Park, you bet, what AP wouldn’t but I also like to stroll through the World Showcase at Epcot. This new park idea should have been built on the Strawberry Field property. So long California Adventure. You will hold a place in my heart. Hats off to the original California Aadventure Imagineers you did a wonderful job, bold vision for short sighted public. Is there any chance any of the amazing changes and upgrades could come to Disney’s Hollywood Studios? The Red Car Trolleys look like they’d be fun! You can see the actual Glendale-Hyperion Bridge in the movie “Who Framed Roger Rabbit?” when Eddie and Roger are being chased by the weasels. I know that many people liked the old entrance, but as nice as it was, it was way too contemporary and not exactly up to Disney standard. Until recently, I had no idea that the new bridge was going to be a recreation of the Glendale-Hyperion Bridge. Very cool. I’m really looking forward to Buena Vista street. The new entrance plaza will definitely be an upgrade.